Some people enjoy their Sunday Funday on a lake, by the pool or simply escaping the heat in an air­conditioned refuge. I opted for a fourth, dumber option —­ bike ride. At the end of that mistake, I needed a pick­-me-­up that brewery visits often provide. Sounds like a Heist kind of night. Heist Brewery (2909 N. Davidson Street) opened in September of 2012 in the NoDa neighborhood, just blocks from brewing compatriots Birdsong & NoDa. 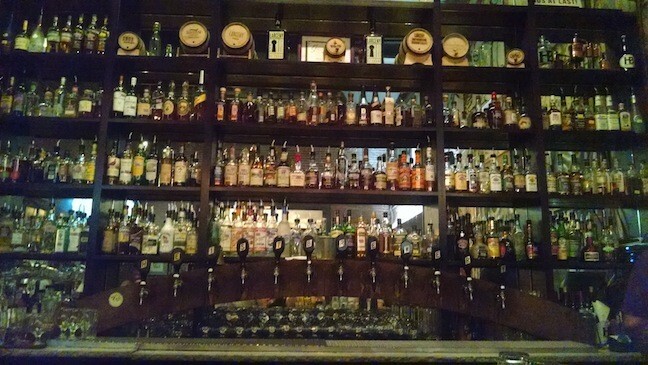 It’s a brewpub, meaning there’s a full food menu accompanying their beer & cocktail offerings. 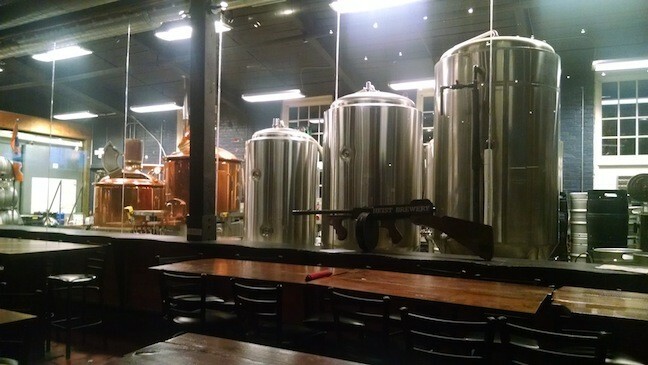 The main dining area has an ample view of their brewing area. The brewhouse is gorgeously all ­copper­ clad like a brand­ new penny, next to the stainless of the fermenters. Decor throughout is richly wood­centric, and adds a certain warmth to the room. Two things I’m not ­— Creative Loafing’s food or cocktail critic. 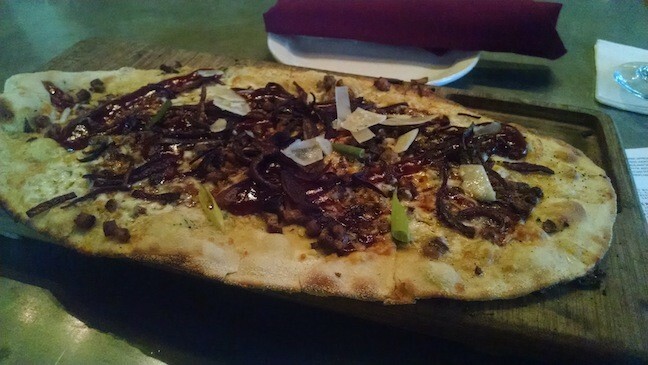 Let’s just say I was completely impressed with my duck flatbread, and the wall of liquor is awe-­inspiring. I’ll make it a point to return for their famous brunch and a libation. For now, I’m here for the beer. Tonight’s beer menu lists eight options, two of which I learned have sadly gone off­tap earlier today. Offerings skew to Farmhouse-­style ales, with four of the listed falling into that category. A fifth, an American stout base, even gets the farmhouse ale yeast treatment. I lead with Ancho Mamma’s, a farmhouse ale infused with ancho chilies. Pepper notes blend seamlessly into the spicy yeast notes, and provide additional depth. The body’s a bit thicker on the tongue than I prefer for the style, but that raisony smokiness and slight chest­-centered heat distract me. Next up to bat is San Fran Disco, an American pale ale. A big resinous presence greats me, courtesy of a healthy dose of west coast hop varietals. Body is on the lighter side of medium, and I get a nice prickly finish. It almost make me want to relocate to a patio table, until I remember I’m escaping the heat. Time to take it home with Cross Variation, my liquid dessert choice. It’s the aforementioned stout base fermented on a saison yeast strain. The combination on paper had me initially skeptical, but I’m coming around with each sip. Big chocolate on the nose with coffee undertones start it off, though the yeast keeps trying to pop through without much success. I can’t help but wonder what a banana-­forward yeast strain like Hefeweizen could do here, though. Sadly, one of the kicked­ earlier beers was the Barrel­-aged Cataclysm, one of the tastiest libations I’ve encountered this year. It’s bested only by its sequel, Cataclysm 2, which is also currently receiving the bourbon­ barrel treatment. You can count on me being there on that beer’s upcoming release day, just as you can look forward to a special surprise concerning that beer that I can’t talk about yet. Weekend warriors to Heist are urged to venture here earlier in the week in order to try Not So Small Batch release. A new beer in this constantly­ changing series drops every Sunday and departs the tap lines before Wednesday. This week’s offering was a sessionable amber ale, Ruby Roo. This is far from my first visit to Heist, nor will it be the last. I’ve grown quite fond of their grilled cheese and tomato bisque, and their flatbreads have consistently impressed. The beer lineup may have stumbled a little out of the gate when they first opened years ago, but they’ve managed to completely turn the program around under new brewers Eric and Alexa. One day, I’ll give the cocktails the attention they deserve; I’m sure my bartender Stefan can take care of me in that regard. Article edits have wrapped up at home, so now to reach into my hat and find out which area brewery I’ll be visiting next. Lucky me: I get to beat July’s heat with Lenny Boy’s beer and kombuchas. See y’all soon!